I feel fortunate because the house I bowl at is known for being fairly tough. People who average over 200 are rare, not the norm (there are only 2 in my league right now). Since those are the kind of scores and conditions I was used to before my long layoff I like it like that. Success on any given lanes is dependant on what others are doing on those lanes. It does make the whole system kind of skewed because someone could be averaging say 210 on a house-shot and someone averaging 190 on a tough shot and that 190 average person is actually fundamentally a better bowler than the person averaging 20 pins higher on a house-shot. Also success is dependant on how much you bowl and how much you practice. I think bowler’s are pretty aware of what is going on and are realistic about it however. It did not take me long at all after joining a league 2 years back after a long layoff that the house I was in were tough lanes and the new lanes 35 minutes away you could average 20 or 30 pins higher at. 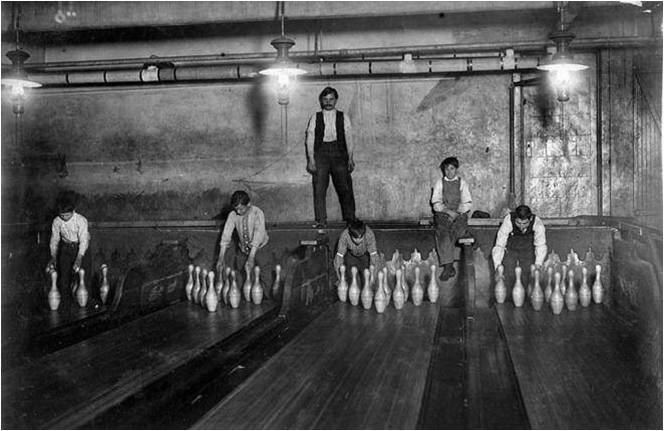 It is common knowledge by people in the sport so the only people you are going to impress by having a hefty average at a walled-up house-shot are people not really familiar with bowling. Also throughout a long Winter league you usually get to know what bowlers are in 2 or 3 leagues and practice all the time, the ones who only bowl the one league, the ones who take the sport more seriously, and the ones who are just in it for the fun so you kind of know where you stand among whatever category you fit into. I guess human nature is what it is and most people are going to go where they can do better. If houses where easier shots are attracting bowlers it must be working. My decision is actually a no-brainer because the easier house is 35 minutes away so higher scores or not, the drive isn’t worth it to me. Still I do have to admit if there were a known easier house at the very least curiosity would want me to try it to see what I could do there. High scores take precedence over "a fair shot". I don't care what part of the country you are in this is standard fare. Unless you are the only game in town you pretty much have to make the shot easier to keep the doors open. A house could get away with being 10-15 pins lower than the highest scoring house and, as we know, there are some bowlers who actually cherish a more difficult and challenging pattern, but they make up a much smaller percentage of paying patrons. "There are no magical balls, just magical bowlers"
i think my house is doing something like that because they changed the pattern recently and we have been scoring bigger and bigger recently i nearly threw my first 200 yesterday and i have only been bowling a couple months and my last average was 149. my friend just bowled a 268 yesterday but i think he got some pretty lucky breaks. the pattern is really wet from 3rd to 5th arrow then dryer on the outsides. Regardless of what we all say and think, bowlers are attracted by the ability to score high. The laneman is God when it comes to how you bowl.